PHOENIX — A quarter-million more fish. With lakes around the state extra full, the Arizona Game and Fish Department needed extra fish. And it got them. 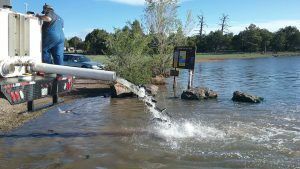 During the past week – in preparation for the Memorial Day weekend — AZGFD has been stocking an additional 20,000 trout and catfish into waters statewide. Through June, we’ll have stocked a quarter-million more rainbow trout, catfish, bass and sunfish statewide. After heavy rains and runoff this spring, the lakes are replenished and ready for angling action. Most catfish are going into Community Fishing Program waters: give Mr. Whiskers a try. Or plan a trip to where the extra trout have been going: Woods Canyon and Willow Springs lakes on the Mogollon Rim (both have tiger trout) and Kaibab Lake near Williams and Ashurst Lake southeast of Flagstaff. Also, during the week of May 22, scenic Lynx and Goldwater lakes in Prescott will get extra trout. On Wednesday, May 17, the first stocking of bonus rainbow trout, purchased from Crowthers Freshwater Trout in Colorado, were stocked into Ashurst Lake. Anglers fishing at Ashurst Lake that day started catching fish as soon as the stocking ended using small spinners such as roostertails and small spoons. Knoll Lake had its first stocking of the year last week and will get more rainbow trout this week. Catfish are also being stocked into City Reservoir near Williams and Frances Short Pond this week. Chunks of hot dog make great catfish bait. Plan a trip now. Need a license? A General Fishing License is $37 for residents and $55 for non-residents, Combo Hunt & Fish Licenses are $57 and Youth Combo Hunt and Fish Licenses are $5. All are good for 365 days from the date of purchase. Save time and buy online, 24/7.